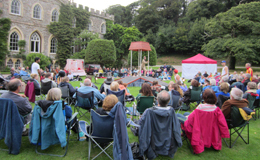 Come and enjoy some really fabulous theatre productions this summer at Hartland Abbey. 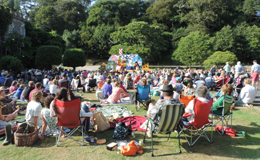 Set against the backdrop of this historic house, so deeply steeped in the history of North Devon, this year’s productions promise to keep theatregoers of all ages and tastes well rewarded with some fantastic productions from different travelling theatre companies. It is a perfect reason to get together with family and friends, bring rugs or picnic chairs and enjoy a night under the stars! We have some really exciting productions to look forward to this year – further details and images will appear when we receive them from the theatre companies. All thanks to Richard Wolfenden Brown of the Plough Arts Centre who chooses such spectacular shows for us each year! Do you think, because I am poor, obscure, plain, and little, I am soulless and heartless? You think wrong! — I have as much soul as you — and full as much heart! It’s Friday night and Ben knows that means only one thing – staying with Granny! There will be cabbage soup, cabbage pie and cabbage cake to eat and Ben knows one thing for sure – it’s going to be soooooo boring! Heartbreak productions invites you to share in this exciting escapade, a David Walliams best seller adapted for the outdoor stage. Join us, Ben, and his Gangsta Granny on their grandest adventure full of forbidden fun. 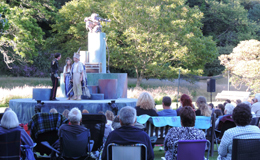 Grounds open free to those attending performances 1 hour before start of 5pm shows, 2 hours before 7pm shows. Bring rugs/low backed seating/picnics. Refreshments. Bar. Barbecue, Ice creams. Cream teas before 5pm shows. You can always join our Facebook and Twitter feeds for up to date information and special offers. “Plough Community Theatre created a surreal comedic air that gave a sense of a rural community in an isolated grip of madness….we became part of this insanity and had a jolly good laugh” Tony Glynn North Devon Journal (On ‘Lark Rise’ 2013). Hartland Abbey is off the A39 between Bideford and Bude. Take B3248 through Hartland village towards Hartland Quay.